Consumer Reports reveals expert advice on whether specialty pillows actually work, plus some shopping tips to help you pick the pillow of your dreams. 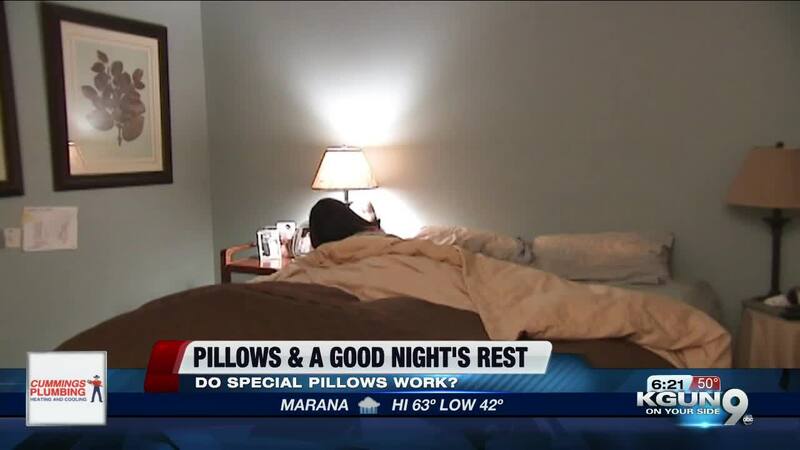 TUCSON, Ariz. - Specialty L-shaped pillows claim to support your head, neck, shoulders and upper chest. It's among several new specialty pillows Consumer Reports took a look at, including anti-snore, cervical and wedge shaped. "So many people look for a pillow that feels right in the store but a squeeze can only tell so much," says Haniya Rae, Consumer Reports. "You actually have to lay on it for 10 -15 minutes before your neck sinks into the pillow." And because everybody's body is different, CR says there's no one size fits all. For example, cervical pillows claim to alleviate neck pain. "Experts we've spoken to say that a cervical pillow can help relieve neck pain but a lot of it depends upon fit," says Rae. "If that pillow is too high or too low it can affect the way that your neck is laying on it and cause more pain." Another mistake people tend to make: over correcting what's wrong with their current pillow. "If they have a pillow that's too flat or too soft they might go out and look for one that's a lot fuller and firmer or they'll sleep on too many pillows, and that could upset the natural curve of their neck," says Rae. "Instead we recommend that people find a pillow that fits their sleep position." If you're a back-sleeper CR found one of the specialty wedge pillows may be an option. "If you have snoring or sinus issues, that wedge pillow can elevate your head and might relieve some of that pressure," says Rae. Side sleepers have more options but you still want to make sure your pillow is properly supporting you. "Four inches off the mattress is the best way to maintain the natural curve in your head and your neck," says Rae. Consider firm or extra firm pillows made from memory foam or latex to keep your head at the proper angle. For more information on specialty pillows, click here.